Telling someone you love them for the first time can sometimes feel a bit stressful – unless he tells you first. Relax a little … sometimes it doesn’t have to be said at all; you might just think you should say it. In fact, there’s nothing wrong with waiting to tell someone you love them. Guys usually take longer to fall in love than women do, so even if you are in love with him, you don’t have to tell him you love him immediately after you realize it. Pick the time and place. When you feel ready and want to know how to tell someone you love them, there are still do’s and don’ts involved. We’ll let you know when you should and shouldn’t say those three special words so that you’ll never need to stress about something so wonderful again. When you fall in love with a guy and you’re pretty sure he loves you, too, you’ll likely be together for a long time. Chances are, you’ll fondly look back at the first time you said you loved him. You don’t necessarily want that memory to include the Department of Motor Vehicles, the grocery store, or another non-intimate place. There should be some romance involved the first time you tell someone you love them, so wait until the setting is right. This one applies only if you know it’s something he’ll hate. Some people love PDAs, the more elaborate the better. More on that here. If you love him, you’ll know whether he loves public displays or hates them. 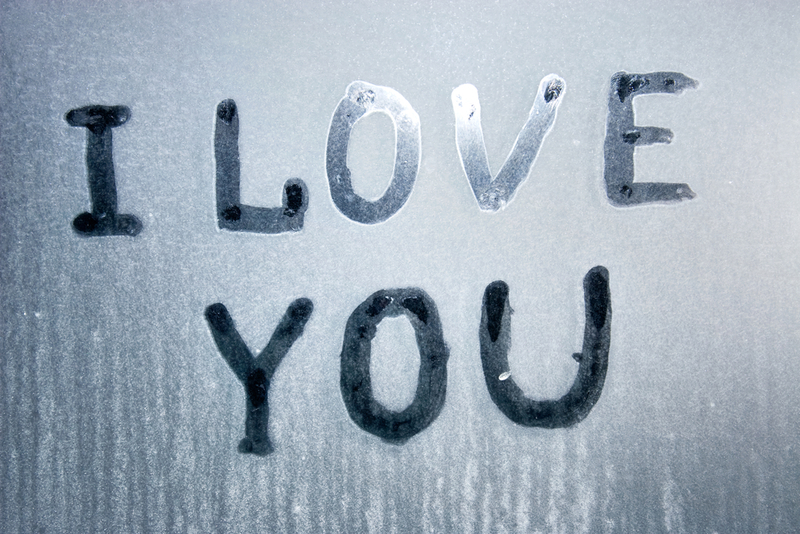 Generally speaking, it’s better to say, “I love you,” in private. It could be awkward for him to express emotion in public, not to mention that the people around you might feel uncomfortable. When you tell him you love him for the first time, it should usually be a private moment. You might always communicate by text or email, and that’s great. But neither is right when you want to tell him you love him for the first time. He’ll probably think you’re joking around, being sarcastic, or not taking what you just said seriously. And that couldn’t be further from the truth in your mind. So, remove any possible doubt, and reserve those words for when you’re in person. You might think you’re in love, but if you’ve just met him or have only been out with him a couple of times, you might be confusing lust for love (read more about that in this post), so you shouldn’t tell him you love him just yet. When the relationship is this young (or if it isn’t even a relationship yet) you don’t want to scare him off. He might not share your feelings, or he might think that you go around saying, “I love you,” to anyone. After all, you said it to him, and you barely know him. If you truly are in love, make sure by seeing if you still feel this way after you’ve been dating for a while and that you have both developed a certain comfort in being with each other. Check out how to know if you’re in love and this list of signs you’re in love. When you see that the relationship is going nowhere and is probably going to end soon, it’s a bad idea to tell him you love him. Doing so when you know the relationship probably won’t last is using the words as a guilt trip to get him to stay. But having him be with you because he doesn’t want to hurt you is not a sustainable relationship. Both people need to want to be in the relationship and be in love for it to work. If you know he isn’t into you, don’t tell him that you love him. The words, “I love you,” are often referred to as “magic words,” but they aren’t magical enough to change the way a person feels. If you tell him you love him when you know he doesn’t share those feelings, he’ll feel uncomfortable. He might even become concerned that you’ll turn into a stalker. If you wait, maybe the relationship will develop into one of mutual love someday. But you can’t force someone to love you if they don’t feel it. Go ahead if you recognize these signs he loves you, however. When wondering how to tell someone you love them, the best way is to do so when the two of you are alone together in a private place. Ideally, the place can be romantic as well. Maybe you’re having a picnic in a beautiful park setting or at the beach. Or maybe you’re away on vacation and are tucked away in a lovely café. When the mood is right, however, you can be anywhere, as long as you can just be into each other. Don’t make a big production out of telling him you love him. You don’t need to hire a small skywriting plane that spells out the words high in the air for everyone to see. That’s kind of cheesy, for one, and making a grand production out of telling him you love him might make him wonder whether you’re really sincere. You also don’t want to be super nervous and leading off by announcing something like, “I’ve got something I need to tell you.” This ruins the mood and makes him think he needs to defend himself. If you love someone and want to know how to tell someone you love them, simply say it if you feel it. The words are powerful and don’t need a grand display or a big lead in. When you tell someone you love them, you should do so without any expectation of hearing it said back to you right away. He might love you too but just isn’t ready to say it yet. Or maybe he’s not completely sure how he feels. Besides, if he says it just because you do, he might not mean it, and you can probably tell. If you can tell that he doesn’t want to say it back, get rid of any awkwardness by letting him know that you just wanted to share that with him. Give him a kiss and let him know that you’re happy, whether he says it back or not. Keep in mind that there are no set rules for telling a person you love them. Every relationship is different. Some people fall in love faster, and some take more time. Learn about how men fall in love. Some people are more romantic, and some are less so. The advice here is general information. Only you know the dynamics of your relationship. And you can use them to find the right way to tell him you love him, not just the right time. When you have determined it’s the right time and the right place, start talking about the relationship. Let him know how much you care about him and what you love about the relationship. You might want to frame the conversation by telling him when you first realized that you loved him. And then just say it. It can be nerve-wracking to tell someone you love them, but if that’s how you really feel, then it can be a great thing.